How much you enjoy James Blish’s “Jack of Eagles” depends on how much scientific jargon you’re willing to wade through. This is the 191st in my series of Forgotten Books. This week we look at a writer I have read a fair bit of, some I enjoyed, some I did not. James Blish is considered a fairly major writer of science fiction between WWII and the beginning of the New Wave in 1967. He was nominated for a Hugo Award twice during his lifetime, winning Best Novel for A Case of Conscience. He was nominated for the Nebula Award three times, not winning in all tries. He has since been nominated for three Retro-Hugo Awards which he won twice for early shorter versions of A Case of Conscience and Earthman, Come Home. Still an impressive list. I really enjoyed the four Cities in Flight novels, of which Earthman, Come Home was a portion. His After Such Knowledge series featuring A Case of Conscience, Doctor Mirabilis, Black Easter and The Day After Judgment was not a sequence I particularly liked, though. Case of Conscience was okay but overlong. The rest, I finished but had no desire ever to re-read. Other novels I liked included VOR, A Torrent of Faces (with Norman L. Knight) and the novella “There Shall Be No Darkness,” which was an early werewolf novel. 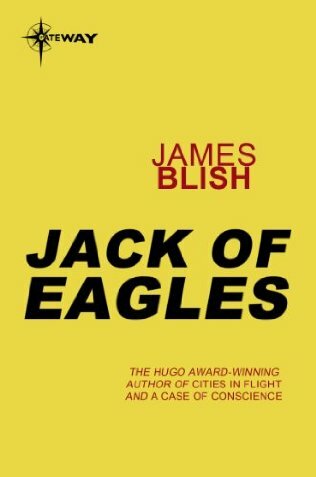 When I selected Jack of Eagles, I did so thinking I had read it before. Very quickly, though, I became aware that this was the first time. I think I initially had it confused with VOR. But I read it and it was OK. Again, not anything great, but I did not begrudge myself the time. The novel tells the story of Danny Caidan, a journalist at a food service magazine in New York City. He has the amazing ability to tell people where they have lost items. Other than that, he’s pretty normal. Until the one day he is called on the carpet for writing an article that says a wheat company is about to get in trouble with the Feds for insider trading. When asked for a source, he cannot provide one and is summarily fired. Gathering his things, he begins to wonder about his situation. He visits a stock broker and wants to buy some futures in the wheat company. If what he wrote was true, he could make a killing, ironically on “insider trading.” He visits his bank and finds he has a tidy sum, so he goes to a bookie and makes some bets on horse races. His bets all come in. Since he bet modestly, he won modestly. He also visits a fortune teller and meets her niece, Marla, who wants to know what tricks he is using to scam the rubes. He also visits a group of psychic believers. Suddenly, everyone wants a piece of Danny Caiden. The FBI and SEC want to know about insider trading and how he was able to break the news on a very secret investigation. The gangsters running the bookie outfit want to know how he gets the winners correct. The psychics want to know the true extent of his power. He seems to be a precog who has some telekinesis and the ability to teleport and they are not sure what else. He could be a danger to them, since he does not want to follow their party line. Anyway, Danny has to work out his problems with some help from a friend and save the girl while avoiding jail or death. It was an OK read, as I said. Your mileage may vary. I will probably not revisit another Blish title in the immediate future though. Series organizer Patti Abbott usually hosts more Friday Forgotten Book reviews at her own blog, and posts a complete list of participating blogs. This week the lovely talented and vivacious Todd Mason is doing those honors. This entry was posted in Books, Forgotten Book and tagged A Case of Conscience, A Torrent of Faces, Black Easter, Cities in Flight, Come Home, Doctor Mirabilis, Earthman, Forgotten Books, Golden Age Science Fiction, golden age sf, Hugo Awards, Jack of Eagles, James Blish, Nebula Awards, Norman L. Knight, Patti Abbott, Robert A.W. Lowndes, sf novels, The Day After Judgment, VOR by sanford. Bookmark the permalink. Like you, I’ve found James Blish to be an uneven writer. Later in his writing career, Blish wrote those STAR TREK books that he’s best known for. I like the four Cities in Flight novels a lot, best of all the things by him I’ve read, better than my next favorite, Vor. George comments Blish is best known for the Star Trek novels, but I think only to an audience newer than those of us who grew up reading SF in the Fifties.